I've always say that I never want to live a regret-filled life. I never want to look back at an event, situation, relationship and say, "Man, I wish I would've worked harder, loved more, or reacted differently." Yet I've found myself in more than one life experience thinking and speaking precisely those words. I think it's safe to say we all have these moments day to day, month to month, year to year. They're nearly unavoidable, no matter how much effort is put into the avoiding. But we go on, and the next time a similar experience rolls around, we deal with it as best we can. 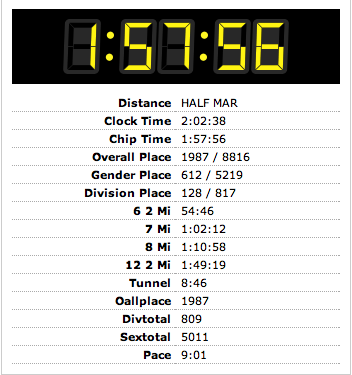 Yesterday, the racing season culminated for me with the Detroit Half Marathon. I ran the full last year, but I ran more to complete it than anything else. I ran the half the year before that even, but again, I finished it feeling happy to have even made it that far without keeling over in my Asics. This year was different. I wanted to work harder and run faster. I set out eight weeks ago... nah, scratch that. I set out back in March with the determination to break into a new class of running, one that put me in an entirely new arena. Now, don't get me wrong - the theme of this blog has always revolved around that of an "average joe" runner, but I wanted to see what else I could do. And so my training commenced. At first, I followed rigorous speedwork and tempo training sessions followed by LSD runs and lots of sleep. Then, I had to return to work. The combination of 30+ kids in a room, increased grading, and a college course of my own to keep up with led me to X out many more training runs than highlight the completed ones. I figured I was out this season. Still, I went into yesterday with my heart ready to pound and my body full of granola bars, Clif Shot blocks, and caffeine. The temp was cool, in the mid 40's, and as the signal went off for my wave to take off, I silently sent messages to my feet to carry me as far and as fast as they could. The first four miles went great. My pace was steady, my mind calm. I crossed the Ambassador with ease and trotted along the Canadian border, eager to get the leg over with. A little girl with bright purple gloves gave me a boost when I slapped her high five and said "Thanks!" to her. Love the little kid high five - best race boost ever. Mile Five hit me a like a ton of bricks, though. My 8:45 pace started to slip, and I worried that I was going to throw in the towel on my sub-two hour goal. As my mind teetered on whether or not to tell my body to slow down, I heard someone yell my name. Becky, a friend and the younger sister of another friend who was completing the full, was suddenly running right next to me and noticed me all alone. With a renewed sense of purpose and a running companion now to my right, I cheered at her arrival and we drove on towards our shared goal. Becky and I finished up the Canadian leg with a 8:46 mile through the underwater tunnel back to the U.S. We even high fived and smiled as we "officially" crossed the border that was marked with the old Stars & Stripes. The end of the tunnel, though, quickly stole our mojo as it wound up a steady incline and around back out to the main road. Luckily, we quickly made it to a relay checkpoint where several spectators, including Becky's parents, were cheering us on. Seeing them once again renewed the pep in our step as we continued toward the Mile Nine marker. A half mile later, she stopped for a sip of water, but I knew I had to press on. I knew I hadn't made much of a time dent in the early miles, and pausing at all could have possibly foiled my plans. The muscles in my legs turned to lead and my chest heaved with every breath, but finally, I turned back on to Fort where, in the distance, the Finish Line gleamed in the sunlight. "Steady, steady, breathe" was my mantra as I completed the final tenth of a mile, hoping that I'd put in enough, that I wouldn't have to regret anything. The finish line itself was ablaze in signs and lights as spectators cheered and photographers snapped shots of faces and bodies displaying odd combinations of the excitement and pain that their owners were feeling. My feet hit the red-and-blue timing mats, and I immediately checked my watch which I'd set as soon as my start wave took off nearly two hours earlier. It read 1:58. I fist pumped, Jersey Shore style, to no one in particular, and then, in a daze, made my way down the chute to collect a space blanket, finisher's medal, and Meijer-sponsored bag of post-race food. Becky met me with a shout and a hug a few moments later, and we gushed about the joy of being done before meeting up with our friends, husbands, and parents to celebrate the day's events. I set out, months ago, to break into a brave new world of running. And I did it - no regrets. Cheers to a great running season! If only she lived in Michigan all the time - my half-marathon pace partner, Becky. It's a brave new world from the last to the first"
The moment to fight, the moment to fight, to fight, to fight, to fight"
A Brave New World + why run?